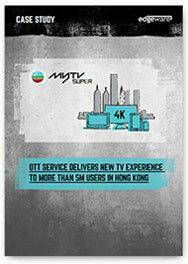 OTT TV service provider myTV SUPER delivers Glitch-Free Live and Time-shift TV with personalized ads, 50 fps in HD and 4K, as well as automatic TV subtitles. Learn how they grew from 0 to 5M viewers in 2 years, delivering 100 live channels at broadcast quality and higher! Thank you for your interest in our products. We have emailed the Case Study to you, but you can also download it directly using the button below.